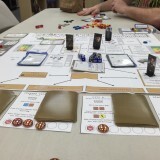 Two weekends ago I attended a small, local, design and testing focused convention put on by the SUP Guild called Prototype Con. After going and reflecting on the weekend, I feel that this sort of Con is something that every designer should take part in. Talking to other designers face to face and playing other unpublished games will give you such invaluable experience. I met a ton of great people, played some really fun games, and received an immense amount of useful feedback on my own designs. Here’s a few tips based on the experience that I had. Even if you haven’t started a company or don’t have an official name for your game, have something that you can give to people with your preferred method of contact so they can find you again after the Con is over. Hand them to every person who you sit down with regardless of what side of the table you’re on. You never know who you’ll meet that will have an impact on your life or career. Leading up to the Con I was having more instances than normal with card sleeves splitting while shuffling. I ended up having a couple of blowouts during testing at the Con, but fortunately, I brought a few spares. All of your games have different needs, but be sure to have spare bits, dice, or whatever your game requires…just in case. I didn’t think of this one ahead of time. On Friday, I noticed several people who had brought their own. The Con provided very simple ones with our names and game name, but if you bring your own you can customize it with your games’ art and any other pertinent info. My official testing slots were on Saturday, so when I got home Friday night, I quickly threw together a couple of simple signs. They don’t have to be overly elaborate. Mine were just on regular paper, but in color and I used a piece of game art to help them stand out just a bit. I really wasn’t prepared for how much talking that I needed to do. I left each day with my throat feeling very raw. I pretty much talked non-stop for 2 days straight and didn’t drink enough water. Keep a bottle of water with you at all times and refresh it whenever you can. Prototype Con provided feedback forms for everyone to fill out, but not every Con will do this. Be sure to bring your own in case they aren’t available. 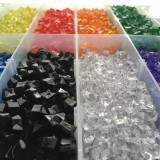 Either find a template of one that you like, or create your own based on the info you want to collect. Don’t just set up camp at a table with your own game. You really need to roam around and interact with lots of other people. Play their games, give honest feedback, and invite them to play yours. The other designers are much more likely to seek you out and play your game if they have a positive experience with you. Bring one (and an extra pen!) and take lots of notes! Don’t just rely on the feedback forms. There are a lot of non-verbal things you’ll notice that you should be writing down. 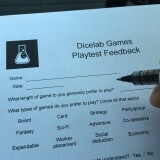 Sometimes, players will tell you things, but not write it on the feedback form (or not fill one out at all) because they told it to you and assume you’ll remember. 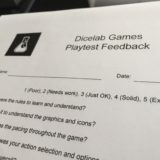 I suggest reading two of my other blog posts: Playtesting and Playtest Feedback for lots more thoughts on this part of the process. What other tips and tricks do you use to prepare for and have a successful convention and testing experience? Just because someone isn’t published doesn’t mean that they don’t have a valid opinion or observation to add to the overall discussion about the hobby. There’s no gatekeeper to limit us from sharing our experiences with each other. Life isn’t always about the end goal or final product, but more about the path we take to get there. The blog has been a lot about my experience and influences while designing games as a hobby and working towards publishing them. If anyone reads my blog and learns something new or adds a new tool to their repertoire, I’ve added something positive to the world. Maybe you should take a closer look at yourself and why you’re being angry about something that doesn’t affect you instead of just posting an anonymous negative comment. A great post, Aaron! The benefits of participating in the community through development are many. Design conventions can also help create grassroots support for your titles and allow you to have mini-mentor sessions with successful published designers. I personally was thrilled to see the work of the SUP Guild on this much larger scale and, like you mentioned, am excited to see more of these types of conventions come to life! Being able to interact with other designers was the highlight of the weekend for me! I can’t stress enough to other designers how important that is. Swapping design idea and contacts, getting and giving feedback, sharing thoughts about marketing or Kickstarter. There’s no reason not to attend events like this.